Ok, just right after we settled with the hotel things. 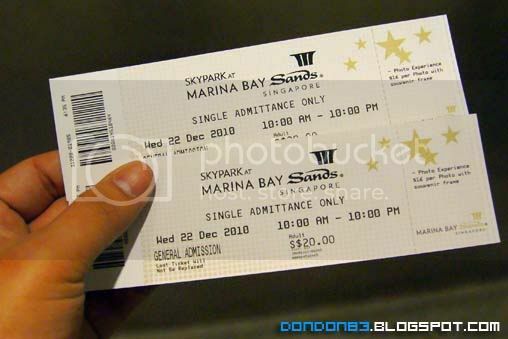 no time to waste, we go for Heading to Marina Bay Sands. where the Casino is located. 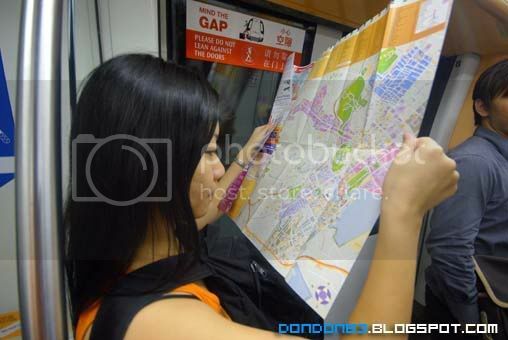 exploring Maps to get there. 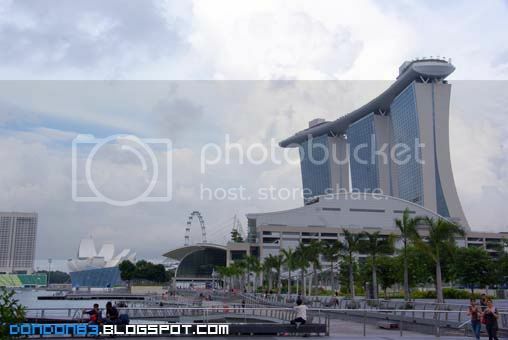 The Three Tower, that's our destination, too bad MRT didn't bring us right in-front of marina bay sands. we still require little exercise walk to get there. oh by the way. Casino is inside that building too. woot. once we got here. 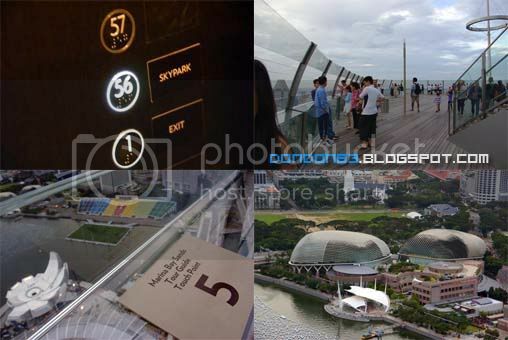 let go up and check out the famous SKYPARK. 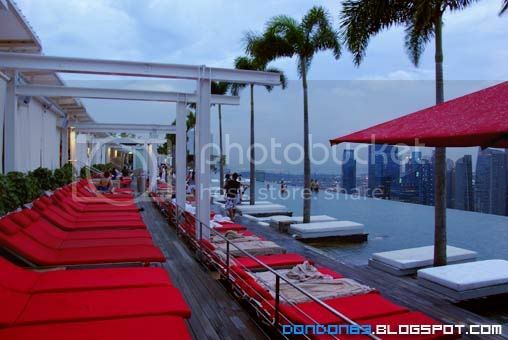 located roof top of Marina Bay Sands. that cost us SGD40 for both of us to up there. and we being informed that there will be a refund if it rains and caused the Sky park to close within 2 hours. The First view i see right after i come out from the Lift. 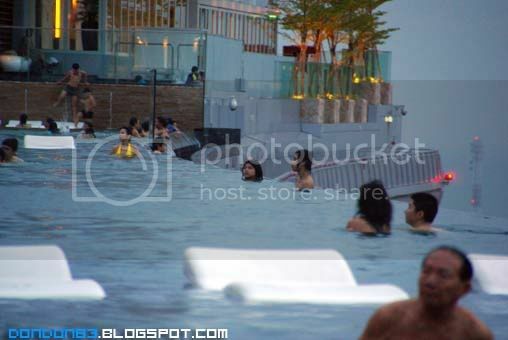 and that's the floating football field, look interesting, what happen if the ball go off the field? swim to get the ball? hmph.. and that's the Eye of Singapore.. ohh ohh that's the MERLION!! can see it from here too. and here's shin lee and the Singapore city background. gorgeous view up here. 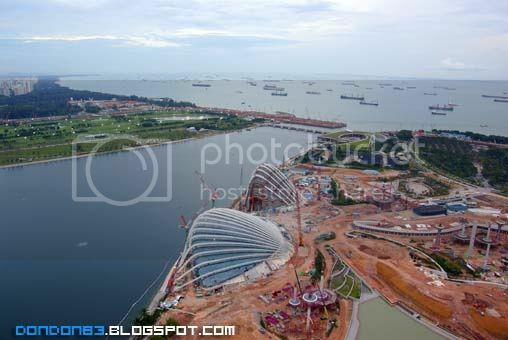 this is the view facing the Singapore Island. let go and check out the view on another side, which is facing sea. hmph.. not as nice as i expected... still under construction.. it may look gorgeous once everything is completed? Hey look! i found a island! 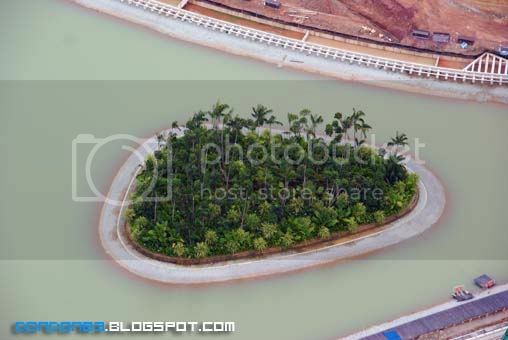 it's an Artificial Island. hahaha. 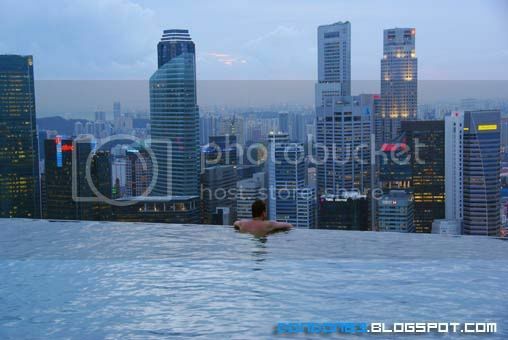 okay.. let move further in, and here we are.. the Infinity Pool. 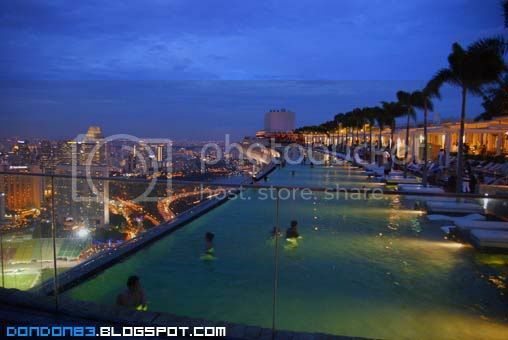 the most breath taking sky pool. a photo of two of us, proved that we been here before :). will they fall out of the pool? i don't think so.. there is a safety distant under it..
and i saw a board here... ADULT POOL only?? scare kids jump from the edge or fall off the edge ? 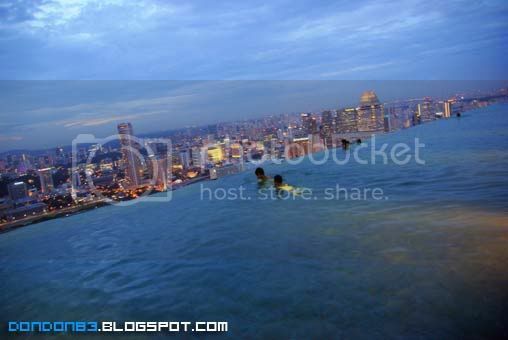 the blue water and the blue sky.. in between is the golden light of Singapore City..
arrrgghh.. i wish i can get a photo like this... i mean.. i'm in the picture.. one day.. i'll return!! The Far end of the pool. 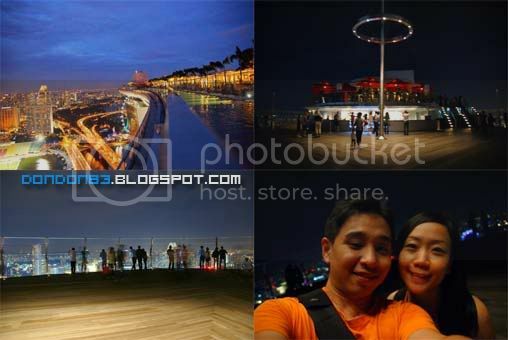 with singapore city glow as background. the sky it getting dark, and the city of Singapore is starting to glow! 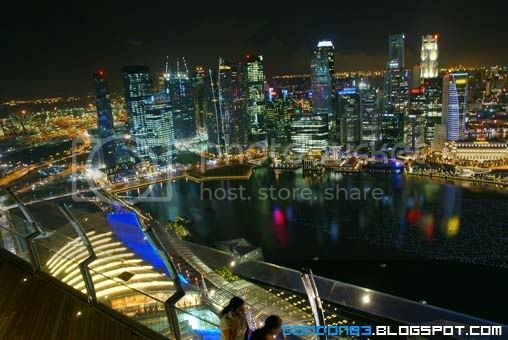 another night scenery of Singapore City Glows. 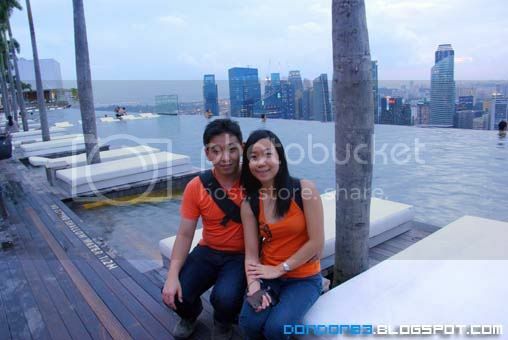 from Marina Bay Sands Sky park. Thanks all for day 1 in Singapore. 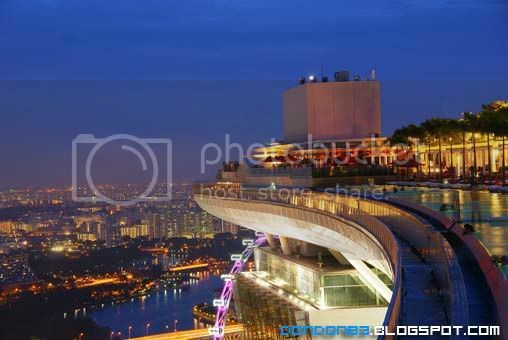 the Marina Bay Sands. a wonderful place. stunning scenery from up here.